I have been longtime admirer of the Android mobile operating system since it was first announced and for the longest while had dreams of owning an android powered phone. The first android device I every saw was a friend’s HTC Hero, I owned a Blackberry at the time but after playing with it for a few minutes it was love at first sight. With help from family overseas I acquired a HTC Legend recently which is the successor to the Hero and for the week and a half I have been a kid with a new toy, here is my quick review. The first wow factor for this phone is the design, the majority of the body of the phone is cut from a single piece of aluminium that gives it a good, solid feel in your hand. On the front is a 3.2 inch 320 X 480 screen with the standard buttons for Android and and an optical track-pad. On the top is a 3.5mm earphone jack and the power button, on one side is the volume keys and on the bottom is the a micro-usb charging port. On the back is a 5 mega-pixel camera and flash. I cant emphasize enough how I love the physical design of this phone and it was an important factor in my decision to get the HTC Legend vs another similar priced Android powered phone. Sadly though there is a kink in the HTC Legend design armor and that is the battery cover which is a little finicky and will result is a crap load of headaches if it is ever lost or misplaced as the phone cannot be powered on without it. The Legend falls in the mid range when it comes to overall specs and feature list. Almost everything expected to be present in a smartphone is present in the Legend. Abbreviated specs list below. None of the 3G networks here in Jamaica is compatible with the HTC Legend which is not a major issue as most of the places I frequent have free open wi-fi networks. When on the road and feel to need to whip off a quick tweet or light browsing I can use EDGE with my cellular service provider. I have noticed that the wi-fi reception on my phones doesn’t perform as well as I’d like with similar devices picking up a strong signal in the same place where I place my Legend. On the software side of things Android makes great mobile OS, navigation is intuitive, the extra polish due to HTC Sense is welcomed and although there are no premium apps available to Android users in Jamaica there are still thousands of free applications and games available in the Android market to tinker with – a process I am addicted to right now as I lose myself downloading and trying all kinds of apps, games and tools. I have no interest at this time to root my phone as recommended by some friends but might consider it in the future. 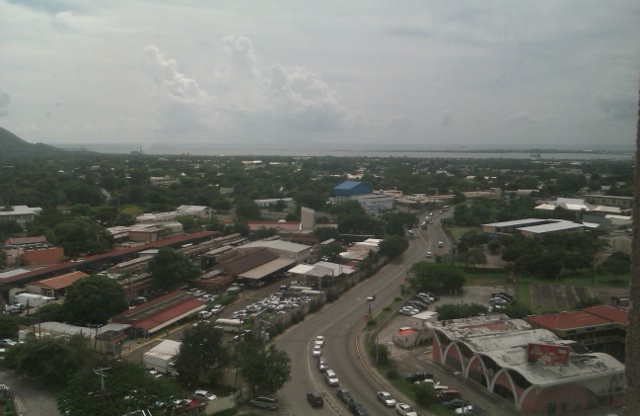 Test video recorded using the HTC Legend cam embedded above. Look out for a few Android specific posts related to Japan, interesting games and other things from now on on my blog or on the Jamaipanese Youtube Channel! Which smartphone do you use? and do you enjoy using it? That does look very nice indeed. I’m not a huge fan of the UI and the camera seems to need perfect lighting conditions (like most cell phone cameras) but otherwise it seems like a good purchase. 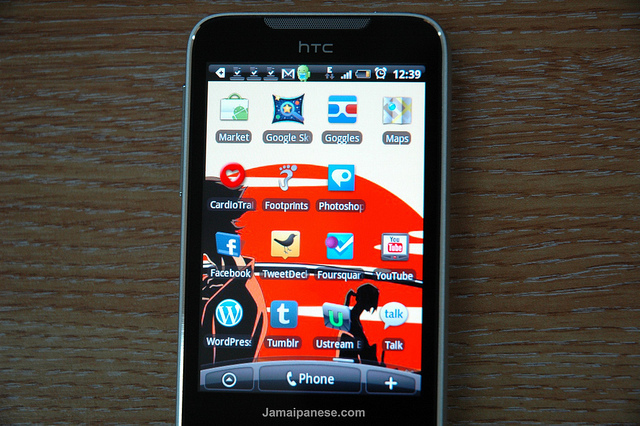 Unlike Yonasu, I really like the look of HTC’s GUI. In fact, of all the Android phones, HTC’s are my favorite. Unfortunately, I’m not willing to pay what they cost here in the US as far as monthly rates go, so I went cheap with a Samsung Intercept on a prepaid carrier. I’ll write a post about that later after I’ve messed around with it more. Congrats on the new phone man! 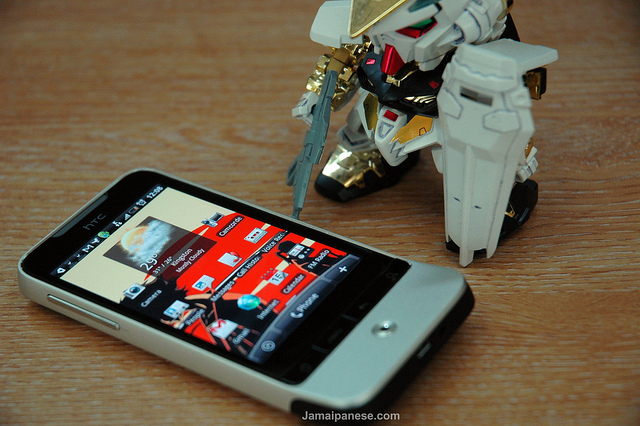 Congrats on the phone and nice Samurai Champloo wallpaper! I notice you have the advanced task killer app, I suspect to help with battery life? I currently have a motorola droid for playing around with. I use it mostly to playing around with such as the barcode scanner for reading QR codes and also android specific apps that aren’t in the app store for my iPod touch. For example, google voice is huge for checking voicemail since i’m mostly without coverage at work, and other fun apps such as google sky map and goggles. The navigation app is also pretty useful. If I were to buy an android phone now, it would probably be the Droid X for it’s huge screen size. The HTC incredible is also great from what i’ve seen. 10 awesome points for you! yea the task killer app helps with battery life and memory to ensure the phone keeps snappy. almost useless here but I have the shop-savvy barcode scanner installed. Unfortunately Google voice doesn’t work here either (yet?). Sky Map is one of my favourite apps, scored major geek points with my girlfriend and younger sister when showed them that app but now they wont leave my phone alone! I like the picture/video quality..really impressive. 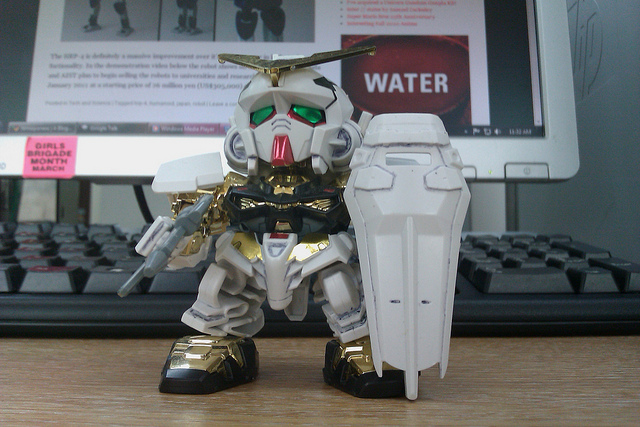 yup I am satisfied with the cam, but if only it was HD! Love my iPhone 3Gs and that Samurai Champloo background. the iphones available here thorugh the local carrier cost an arm and a leg! But not to worry! my face is like this little guy at the moment knarley dude! seeing that flag flying next to the Jamaica flag each day helps to keep me motivated. Soemthing about the video recording keeps bugging me.. i think its the FPS. I use an iPhone, but I have admired the HTC’s from afar since I have seen the ads. I have yet to see one up close, but I think that if I were to ever jump camps, the HTC is where I’d go. I’ve seen the Motorola Androids at work (at least a first gen one) and I was not in the least bit impressed. 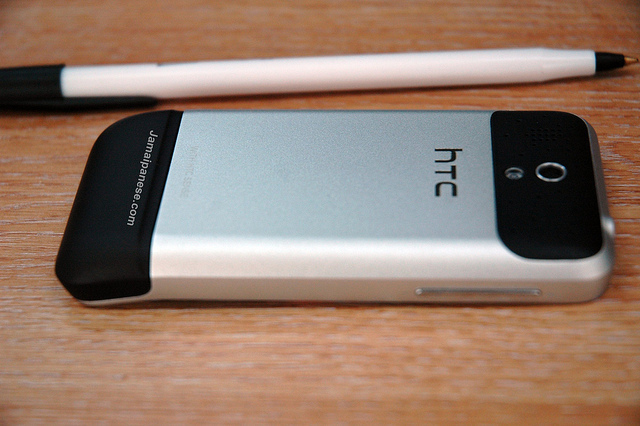 But the HTC’s look like they have made it work. I see one feature that I know would cause problems for an even more clumsier me than usual – that angled mouthpiece (I am assuming it’s a mouthpiece) … I can see myself bumping, scraping and hurting myself on that angle quite easily. Do you find it is particularly sore-thumb-like? 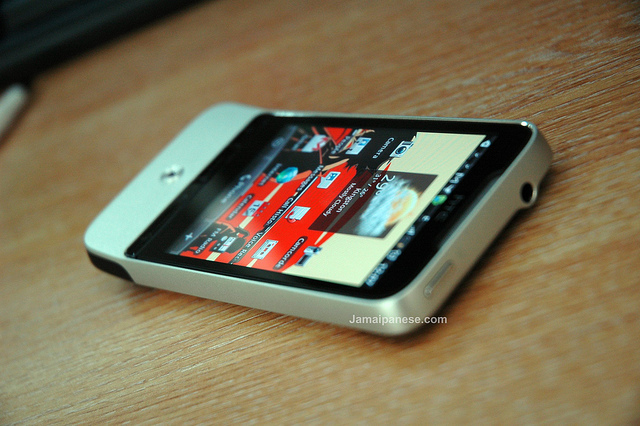 I love the design of HTC phones, this one in particular. The angled section is not necessarily just a mouthpeice although the mic is located there. the angle isn’t that sharp and it feels great when being held in you hand or tilted sideways. You’ll realize it’s usefulness when you hold it in your hands. I always see people reviewing android phones and they all say the same thing; they take photos, listen to music, use apps and browse the net really slowly on wifi or 3G. Oh i almost forgot – they change their wallpapers. IMHO these phones still have a long way to go before they become really innovative rather than being just really expensive touch screens emulating things you can already do on a computer/laptop. There is still something missing that they just haven’t done. That phone looks like a beast. I am seriously thinking of dumping BlackBerry after my recent ordeal with Digicel. You will have to post an update on your experience after you have used it for a while.